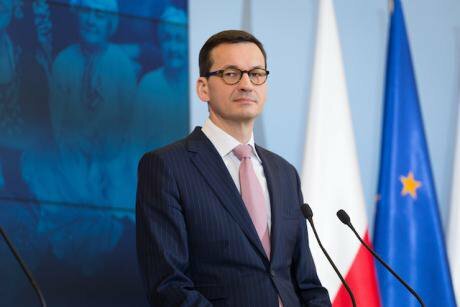 Poland's PM Mateusz Morawiecki at a press conference at Chancellery of the Prime Minister in Warsaw, Poland on 23 January 2018. NurPhoto/Press Association. All rights reserved.Poland’s new so-called “Holocaust law” sends a menacing message to its minority groups by turning the criminalization of hate speech on its head. Hate speech laws are normally enacted as a protection against marginalized populations. But this new law exploits the spirit of such legislation in order to bolster the ruling majority’s authority and to further intimidate vulnerable groups. At first glance, and despite the international furor it has ignited, there is nothing surprising about Poland’s new so-called “Holocaust law”, the Amendment to the Act on the Polish Institute of National Remembrance (IPN). Like many such laws, it too offers an official reading of history. Poland’s constitution, like many modern counterparts, achieves a similar aim in its preamble with reference to the country’s histories of foreign repression – as does its 2017 de-communization law, which calls for the dismantling of Soviet-era monuments, much to Russia’s disapproval. Poland has joined the perennial efforts to legally institute and disseminate official – read flattering – discourses of national history. Memorial structures, national museums, public curricula, repatriation and citizenship schemes the world over serve similar objectives, even if more indirectly than explicitly targeted ‘memory laws’. What have been termed memory laws emerged in the past several decades in response to threats of revisionist Holocaust historiography and have proliferated throughout the post-Cold War era with reference to other histories of mass atrocity. They pronounce official versions of traumatic pasts, often criminalizing these events’ public denial, denigration, or diminution. And in their consensus to obstruct Holocaust revisionism, they reflect a certain degree of international cooperation. They also express a shared value of inclusivity and a commitment to a unified European ethos or identity. The Council of Europe formalized that commitment in 2008 by adopting the Framework Decision on racism and xenophobia to combat “particularly serious forms of racism and xenophobia by means of criminal law,” especially in the face of resurging anti-Semitic expressions throughout new EU member states from Eastern and Central Europe. The law criminalized hate speech, considering it a violation of the fundamental principles – including liberty and democracy – of the European Union and its Member States. Along with the recognized offense of publicly inciting to violence or hatred through, among other acts, the public dissemination or distribution of tracts, pictures, or other material, it also made it a punishable crime to publicly condone, deny or grossly trivialise crimes of genocide, crimes against humanity and war crimes as defined by the International Criminal Court concerning events occurring during and after the Second World War. Importantly, when it came to Polish law, the Framework Decision equated ‘hate speech’ with ‘historical revisionism’, which, as legal scholars have noted, are not equivalent, and in many legislations are treated as separate offenses. The targets of ‘hate speech’ and ‘historical revisionism’ remain fundamentally different, since ‘hate speech’ aims at discursively threatening and injuring an individual, usually from an already marginalized group. Historical revisionists, in the interests of maintaining their legitimacy and mainstreaming their cause, instead prefer using objective language about groups, rather than individuals so as to circumvent charges of incitement to hatred and violence. The EU-wide equivalencing of historical revisionism with hate speech, as advanced by the Council of Europe, unwittingly fosters political redefinitions of the crime of denialism and, more importantly, of hate speech. The Framework Decision provides nationalist historical revisionists – or, in current parlance, neo-authoritarian populists – with grounds for a repressive mechanism to empower xenophobic majorities by further marginalizing vulnerable minorities. The Law and Justice Party (PiS)-endorsed “Holocaust law” achieves just such a cynical manoeuver, consistent with the party’s legal hijacking of Poland’s constitutional system, by inverting the purpose of the IPN denial ban passed in 1998. That existing law had already made punishable, by a fine or imprisonment of up to three years, the public contradiction of facts established as Nazi and communist crimes perpetrated against Polish nationals and citizens between 1939 and 1989. Furthermore, and emulating the German Criminal Code (Section 130), Poland’s constitution (Article 13) also regulates references to the country’s fascist and totalitarian past, citing the endorsement of authoritarian activities as an act congruent with incitement to racial or national hatred. In other words, like the Framework Decision, the existing Polish law reflects a hate speech approach to Holocaust revisionism. This leaves room, as evinced by the new amendment, for its perverse reinterpretation. The currently “frozen” 2018 PiS-endorsed amendment (Article 55.a.1) – pending the Constitutional Tribunal’s review – introduces a new punishable crime to the 1998 IPN law, namely the attribution of any Polish co-responsibility for the Third German Reich’s Nazi crimes or for other crimes against humanity. This contorted logic constitutes an extraordinary example of Holocaust denialism in anti-denialist sheep’s clothing. As numerous commentators have noted, this aspect of the law actually suppresses open and factual discourse about Polish WWII crimes. And it therefore effectively exercises repressive Holocaust denial, while pretending to staunch it. But the amendment and its underlying intentions actually proceed even further than this paradox in cynically subverting and redefining the purpose and meaning of hate speech legislation. If laws curbing injurious discourse serve to protect minorities and the marginalized against a potentially or actually hostile majority, Article 55.a.1 now inverts the objective of such laws. It prioritizes the alleged vulnerability of the majority – the Polish Nation – against the minuscule and inflated threat of historical inaccuracy. It therefore redefines hate speech as an insult against the ruling majority and its myth of national unity and innocence, rather than as a threat to plural democracy. Punishing hate speech is intended to protect those excluded from this myth – those who do not conform to the religious, ethnic, national or racial moulds it upholds. But in reinterpreting this crime as a victimization of the majority, Poland’s “Holocaust law” expresses an openly hostile stance against its minorities, both past and present.